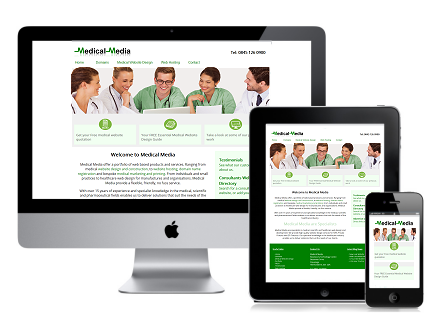 Medical Media offer a portfolio of web based products and services. Ranging from medical website design and construction, to website hosting, domain name registration and bespoke medical marketing. From individualconsultants and small private practices to healthcare web design for medical service providers and manufactures. Medical Media provide a flexible, friendly, no fuss service. With over 15 years of experience and specialist knowledge in the medical, scientific and pharmaceutical fields enables us to deliver solutions that suit the needs of the healthcare industry. Medical Media are specialists in the healthcare sector. Website design and web applications is what we do best. We provide high quality services for our customers with the majority of or business coming from recommendation. Our specialist knowledge in the healthcare industry enables us to deliver solutions that suit the needs of our clients. Responsive Web Design(RWD) is a technique for construction websites that will work on mobile devices such as tablets and mobile phones as well as traditional desktop screens. The elements on the web page adapt in size, location and orientation to fit the size of the screen that the visitor is using. With search engines placing more and more emphasis on mobile friendly websites, it pays to have a site that complys to the latest requirements.